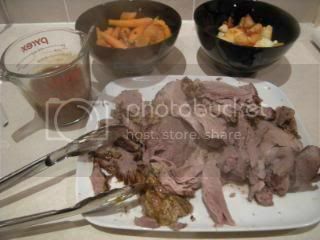 Lamb Roast – is there anything much more Australian than this on a Sunday night? Served with roast potatoes (‘crunchy taters’, if you live in our house), kent pumpkin, sweet potato, baby carrots, and lashings of gravy. Awesome. It took me many years to get the timings right on my roasts. 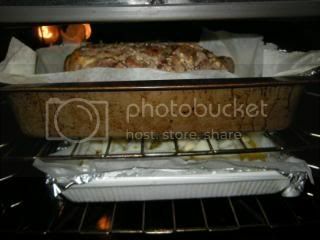 I was constantly serving burnt potatoes with bloody meat, or dried out meat with underdone spuds. But, my hard work is your gain, and I’ve tried to be as detailed as I can on timings in this recipe. 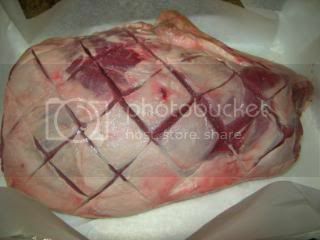 Of course, it all depends on a few factors, but the main one is the size of the cut of meat you have. 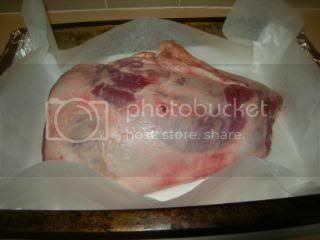 This one is 2.5kg lamb leg. 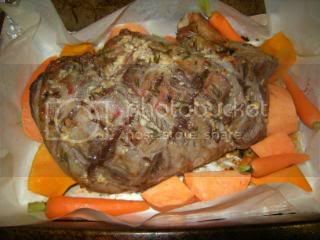 There are many sources out there that say an hour per kilo, and they’re right if you want a completely cooked through lamb leg. 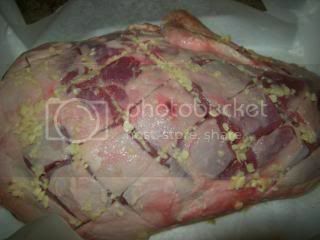 In my opinion, however, lamb should never be cooked right through, but left with a little pinkness. And therein lies the rub: a roast is such a huge chunk of meat that when it’s still red in the middle against the bone, it’s cooked through at the very edges. The trick is to get it red at the bone, but not too red. Daunted yet? Don’t be. 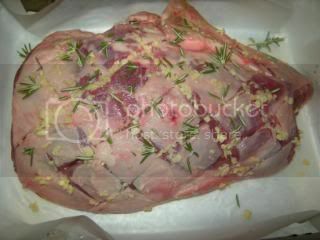 If you’re worried, grab a 2.5kg lamb leg from your butcher and follow my timings precisely. Once you have that down pat, start experimenting with smaller or bigger. Start by turning your oven on about 190 degrees. 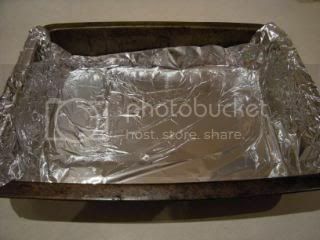 Then line a big baking dish with foil, shiny side up. 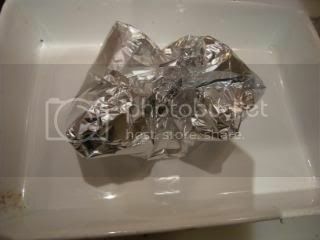 Don’t worry if the foil doesn’t make it all the way up the edges, as long as it has a good attempt at it. 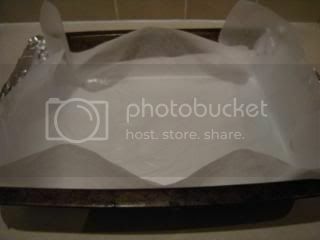 If it doesn’t even do that, use two strips side by side, with a good overlap in the middle. 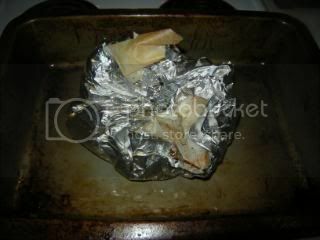 Then line it with baking paper – this you will want to go all the way up, with a bit of overhang. Again, if you need to, use two strips with an overlap in the middle. 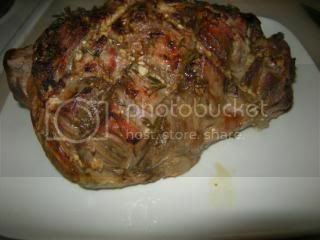 Dump your lamb leg smack in the middle of the dish. 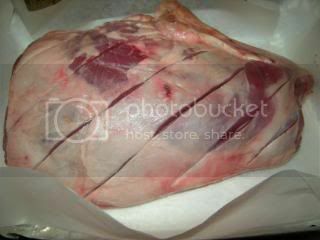 Use a sharp paring knife to cut diagonal stripes in the lamb, about 3-4cm apart. 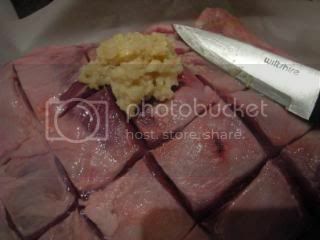 You want to cut through the skin and the fat, and just cut a little bit into the meat. 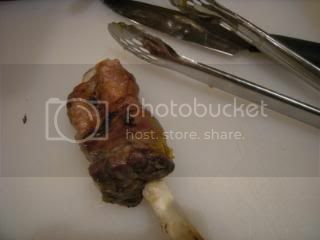 If you have the shank attached (the little bony dangly bit you can see at the back there), just ignore it for now. Cut lines in the opposite direction to create a diamond pattern. 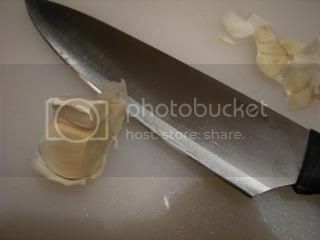 And use your paring knife to smear it all around. See how it fills the stripes you made? Don’t be afraid to slap some more on, if it’s a bit thin. Put a little bit on the shank, too, so it doesn’t feel left out. 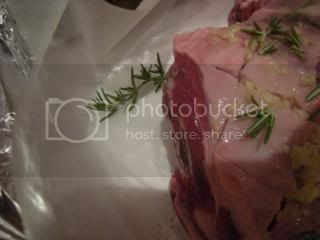 Now, you can’t have a lamb roast without rosemary! 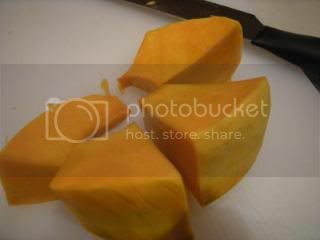 Use as much as you can, peel the leaves off the stalks, and just scatter it all over the meat. 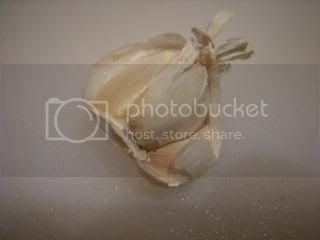 The garlic will help to stick it on there. If you have rosemary going spare, then drop a sprig or two straight into the pan as well. You can now stick the whole lot into the oven. Don’t stress if the oven isn’t quite heated up yet, it won’t matter. 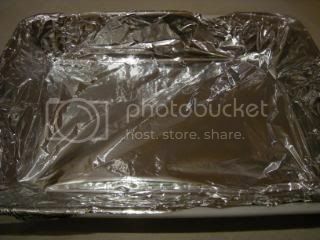 If you have an oven that is not fan-forced, or is temperamental (like mine), and you know where the hottest part of it is, put the roast there for the first half of cooking (the trick is to put it as close to the element as you can). We’ll switch things up a little later on. 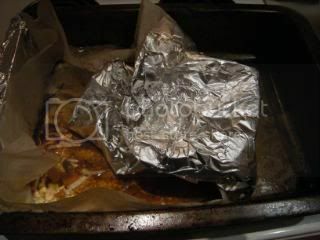 As soon as the meat is in the oven, get stuck into the potatoes. Chats work best, but I didn’t have any this time, so I’ve settled for some pontiacs. 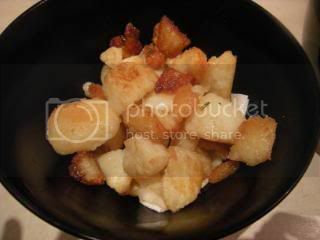 Just try and select a floury potato over a waxy one, so that you get the right crunchiness-factor in the final product. 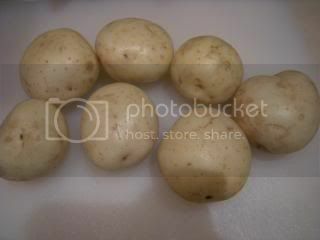 If you’re using chats, pick the smallest potato and make the bigger ones around the same size. 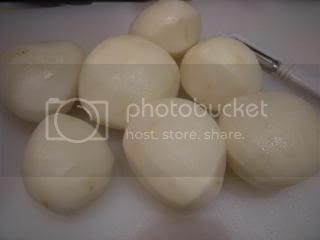 For bigger potatoes, cut them into either halves or quarters, into about 5cm cubes. 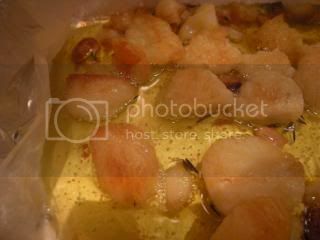 Throw them into the boiling water, and let them go for about 10-15 minutes, or until completely cooked through. If you stick a paring knife into them, you should meet no resistance at all. 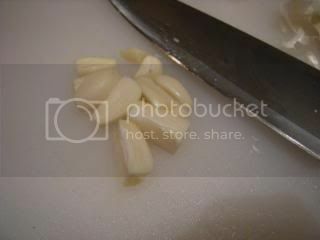 Grab a few cloves of garlic (actual cloves, minced from the jar won’t work here). 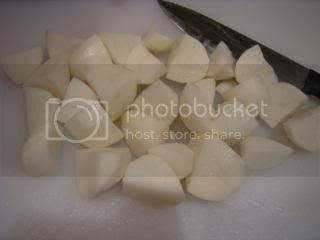 Lop the top and bottom off them, and pull the skin off. 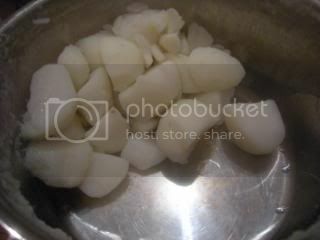 Then slice them lengthways, leaving them in big chunks. Don’t make them too small, or they’ll burn. 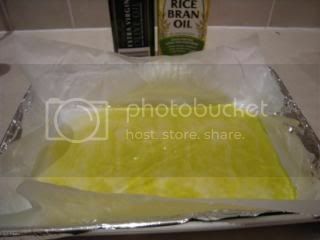 And a good amount of rice bran oil (or canola, or vegetable, or whatever takes your fancy). 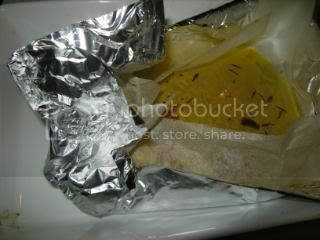 Use about three parts olive oil to one part other oil. When the spuds are done, drain them well, put the lid on, and give them a shake. They should be all burred up on the edges, but still holding their shape. 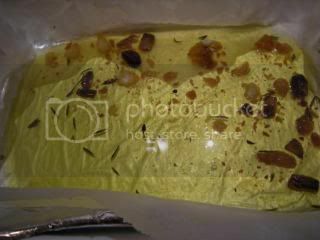 Dump them into the oil, and spread them out evenly. Oooh, this is an arty shot! 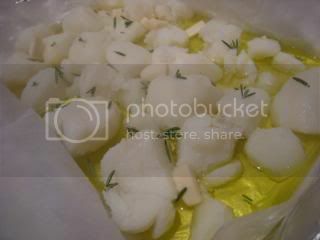 Drop the garlic over them, and throw in a few more rosemary leaves for flavour. 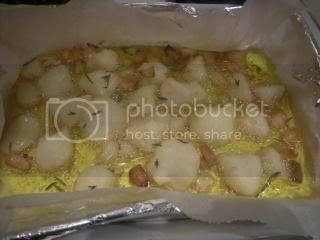 Transfer the roast to the cooler part of the oven (for me, that’s the top), and put the potatoes in the hot part. Now, time to prepare veggies. Take your pick. 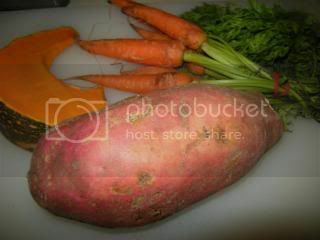 I’ve gone all orange tonight with pumpkin, sweet potato, and the last of my baby carrots. 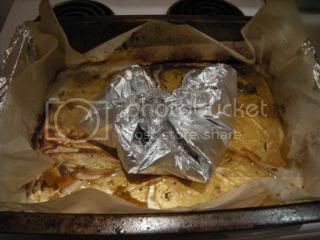 Zucchini also roasts well, but you want to put it in only about half an hour before serving, or it … errr … deflates. Badly. 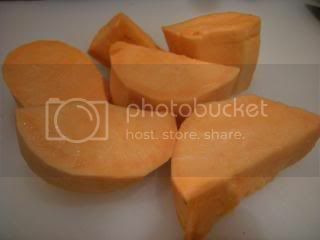 Peel and chop the sweet potato – use big chunks. 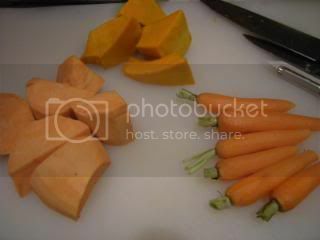 Peel and chop the pumpkin into slightly bigger chunks than the sweet potato. Trim and peel the carrots. 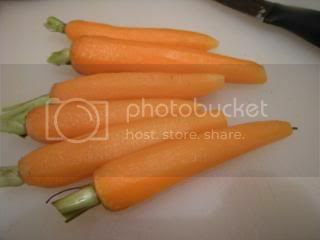 Leave baby carrots whole. 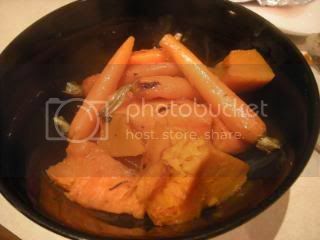 If you’re using ordinary carrots, then cut them into big fat chunks – about 3-4cm thick. 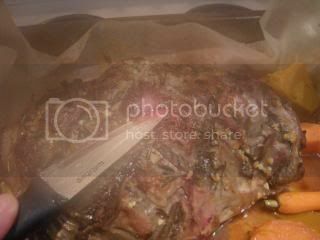 Pull the roast out of the oven. 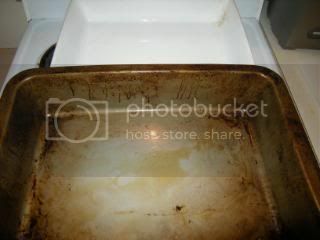 It probably has some juices starting to float around in the bottom of the pan by now, but if it doesn’t, don’t stress. It’ll get there eventually. Sprinkle the vegies around the outside of the roast (don’t, whatever you do, sully the potatoes with these. You can get away with adding a few carrots to the spuds ocassionally, but don’t overcrowd it with all this lot. Besides, they taste much better in the meat juices anyway 😉 ). 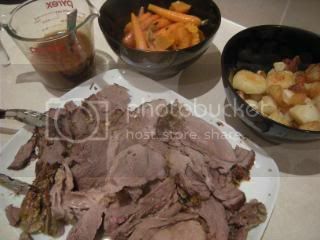 Pull the roast out, and very gently flip the vegies over. It was hard to get a good shot of this through the steam, but if you stick your paring knife in, pull it out, and let the juices run over the blade of the knife, you’ll notice that they’re running quite red still. Don’t do too much of this though, or you’ll end up with all the juices in the pan, and none in the meat, which is where we want it. While you’re here, check the spuds. Do the knife test again (in a different spot to last time of course), and you should see that the juices are running clear, or at least very close to it. If they’re not, stick the roast back in for 15-20 minutes and try again. Grab the roast out of the tin. I find the easiest way to do this without creating a massive mess, is to use a pair of good strong metal tongs (not those wussy non-stick ones they sell) on the narrow, bony end (on the right in this picture), and your chef’s knife jabbed in a good way to the meaty section on the other end. You should then be able to just lift it out and put it on a plate. 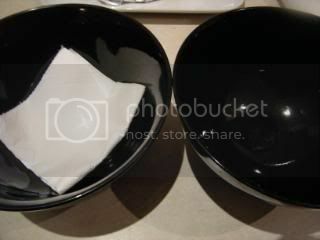 This plate is actually a pretty large rectangular serving dish. It pays to have the extra room if you’re going to carve it on this as well, which I will be doing. Pop the roast vegies back in the oven to keep warm. Once the door is shut, I turn the oven off, as we’re just using it as a warmer from now on. 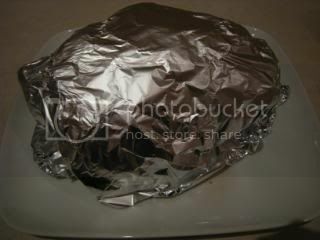 Cover the meat over with foil (shiny-side down). This is using the same principle as we used for the steak the other night. 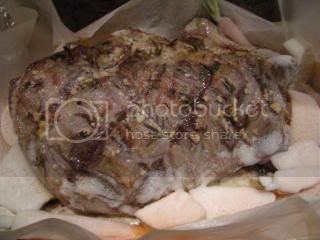 It gives the juices a chance to settle, and distribute evenly throughout the meat. This also helps the cooked on the outside, rare in the middle problem to even out. 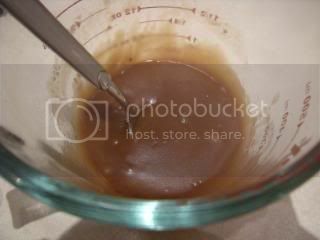 Now, I refuse to make gravy the old fashioned way, in the pan, as it’s dull and boring and always ends up tasting of nothing much but flour and fat. Make it up with gravy powder according to the packet directions, but make it quite a lot thicker (use less water) than they tell you to. Once you’ve gotten the vegies out of the pan you cooked the meat in, pour some of the juices in to the gravy and give it a good mix. Keep going until you get the right consistency. 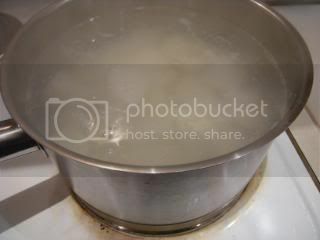 If you run out of juices before you’re done, then just add a little boiled water until it’s right. 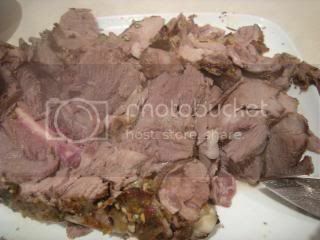 Now, I like to serve a roast in big serving bowls, and just let everyone grab what they want. 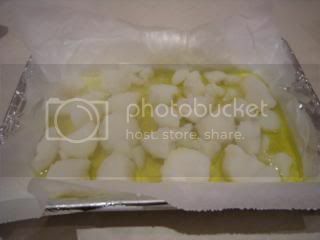 You can see I’ve put a folded paper towel in the bottom of one of these, that’s to soak up the extra oil from the potatoes. So here are our spuds, happily draining while we get everything else done. And here’s the vegies in the other bowl. Now is the time to find a short person to put plates and knives and forks out. It helps to keep them busy while you do the next bit, to avoid amputated fingers. 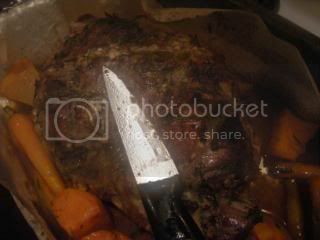 Use either a carving fork or tongs, and your chef’s knife (don’t use a serrated knife, as it tears the meat into shreds – a good sharp, flat bladed knife is ideal. A good quality one that doesn’t flex is even better). Now, I don’t have any pearls of wisdom to share on carving technique, as I really don’t have one (a technique that is). I just hack and slash until it’s in edible-sized pieces. I’m sure there’s someone out there who can educate me. Actually, I could probably ask one of the trained chefs I have in my family, but it’s easier just to ask them to cut it up rather than explain it so I can do it. Dinner is served! Of course, what’s missing from this picture is some steamed greens (bok choy works wonderfully, but so does broccolini, or just about anything, really), and – of course – mint sauce. Enjoy. The cleanup! I do like how easy this is, so I thought I’d do a little demo. 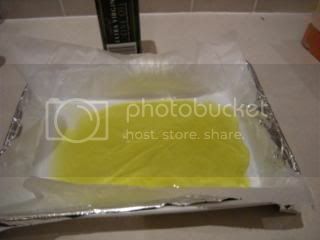 Here we have (dum dum DUM) one oily pan. And then the other end. Very neatly encapsulating all that oil. 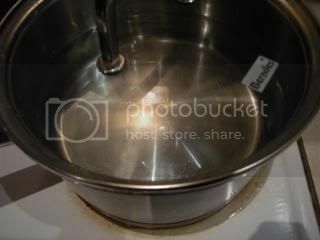 See that pan … look ma! No mess! 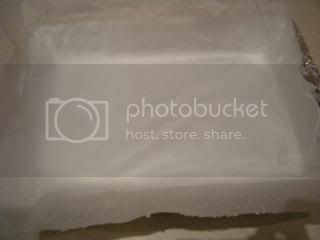 Photos are all in the Lamb Roast Photobucket album. 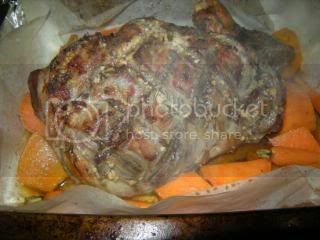 And totally aside from lamb roast, I’d love to hear if you’ve tried any of my recipes, especially if it worked (or even if it didn’t!). Let me know what you did differently, what you did the same, or even just if you impressed the socks off someone … even if that person was you!